YES… THEY’RE BACK and playing at The Hawth Theatre in Crawley…. After a successful tour of the UK last year the Celtic and Irish Cultural Society are delighted to welcome the County Galway based multi-talented cultural group Celtic Flames back to Crawley again. If you like Irish music, song, dance and story this is what you’ve been waiting for. This spectacular show highlights the many and varied aspects of Irish culture in a colourful, action-packed two and a half hour performance – the vigour of the dance, the beauty of the songs, the humour and pathos of the writing, the power of the music – all presented in a beautifully choreographed production with an authentic and contemporary feel. It has everything for everybody – and lots more. It’s educational and emotional; happy and sad; humorous and serious; but above all it is unforgettably entertaining and heart warming. So whether it is a nostalgic trip back to your Irish youth, an exploratory look at your ancestral ways or just a personal love of or interest in Irish culture, this show is for you. Celtic Flames are an exciting 25 piece mixed music group, based in Galway and ranging in ages from 6 to 60, made up of world champion dancers, top class musicians, wonderful male and female singers, storytellers and comedians who play and perform a quality eclectic mix of traditional Irish music, song and dance fused with contemporary idiom. Some members of the group were part of a very successful show called a taste of Ireland, which toured England, Australia, the United States and Canada on six occasions during the 1980’s and 1990’s. This show was very well received and helped to pave the way for shows like “Riverdance” and “Lord of the Dance” and the many other Irish dance shows touring the world at present. The group has been in existence since 2011 and has built up a huge following. They have toured through Tenerife, Ireland and England during 2012 and 2013 and enthralled audiences at the prestigious Monroes Live venue in Galway during the Volvo Ocean Race in July 2012. 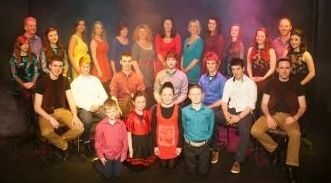 Originally set up as a 10-piece group, they have grown to include the top young talent to emerge from the west of Ireland in recent years and their mission is to entertain! They uses 15 different musical instruments to deliver a unique and vibrant sound, their versatile dancers perform the full dynamic range of Irish dancing including light, heavy, set, sean nós and twig dancing while a diverse variety of singers perform a seductive hybrid of modern and traditional classics and ballads. This atmospheric production generates a brilliant and energetic night’s entertainment. At times, CELTIC FLAMES burn with a light flicker, at times with a searing spark and at times they set the place on fire! So treat yourself to a moody blend of ancient and modern, of a rich musical tradition with a contemporary feel and come to see CELTIC FLAMES perform. It is an experience you will never forget!